Each LED screen model of EOSlab, either a cross, an LED panel or a sports score, it's pre-loaded with a set of animations, one set of edgings and a set of fonts. These settingss are always suitable for the final use, for example, we have specific animations for: optical, orthopedics, pharmacies, dentists, restaurants and many more. 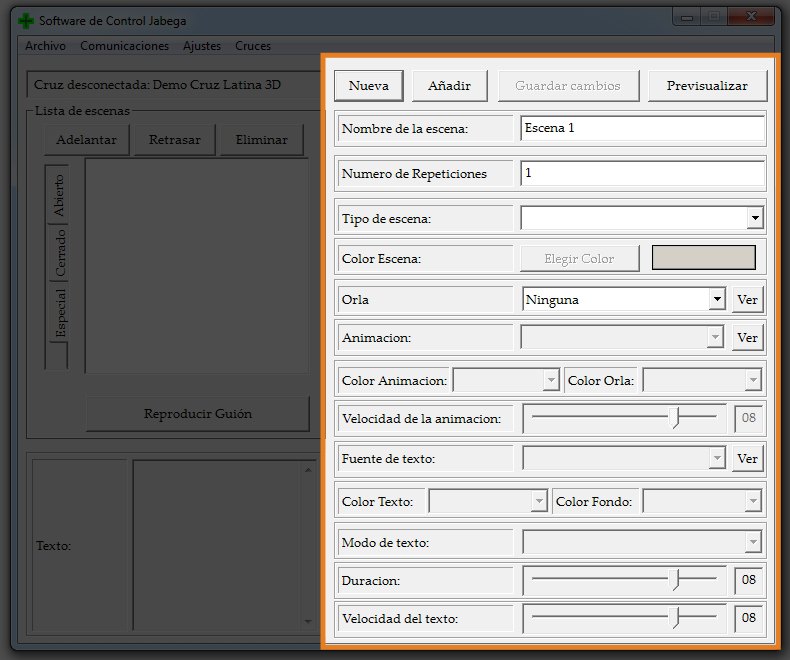 Each new version of JABEGA is fully compatible with the previous one, you can intall it and make it work even with a pharmacy cross made before the new version. The LED panel or pharmacy cross are sent a set of scripts to be played according to a schedule. You may submit up to three scripts. Each script consists of a sequence of scenes, each can be made of an animation background, a message, and a fringe that framed it. To explain the operation of the program we will explore all its options explaining their functionalities. Ussually you will be working with the main window shown down here. As shown in this screenshot, it has a small menu, and the remaining area is used to edit the schedule which subsequently be sent to the LED display. It has four parts: Script, Communications and Device Parameters. In each section we have several options that are explained in more detail in chapter 2. In this section we have a list of scenes corresponding to the selected script from the tabs: "Open", "Closed" and "Special" If you select a scene from the list you can see its features in the scene setup (3) and (4 ). If you double click on one of them, you will see a simulation of it. If you want to simulate the sequence you shall use the "Play Scenario" button. Also you can modify your order or delete some scenes by clicking on the buttons "Forward", "Backward" and "Delete" . The scripts under 'Open', 'Closed' and 'Special' will play in the pharmacy cross or LED panel according to the schedule. This box is used to compose new scenes or modify an existing one. The "New", "Add", "Save Changes" and "Preview" buttons are used to create a new scene, add it to the script, save changes to the script (if it was already created) and simulate it. 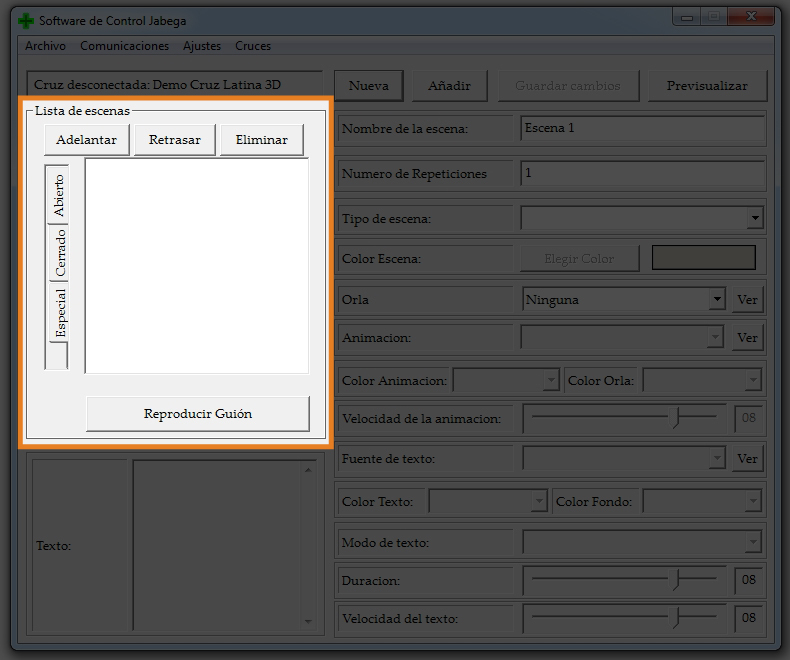 With the other controls you can (from top to bottom): -Insert a name for the scene so you can identify it in the list. -Specify the number of consecutive repetitions you want to have. -Choose The type of scene. 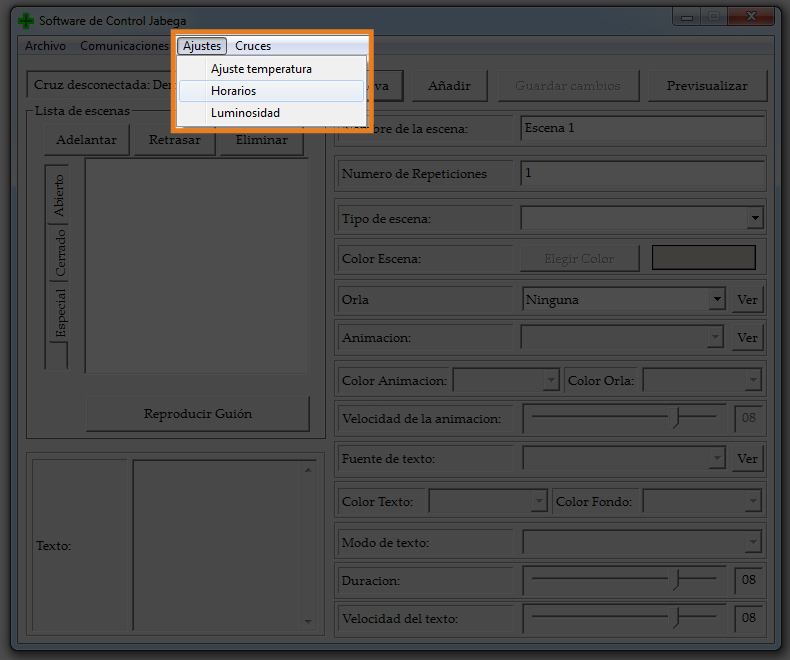 The options are: Animation, Text, Time, Date, Temperature and UV. -Choose A frame. -Choose An animation and speed. -Set the Typeface. -Set the Text effect and its duration and speed. 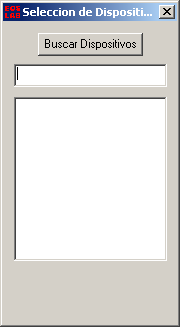 In this box the message to display is entered. First you should choose the schedule tab (open, closed, special) in which you want to add the new scene. Then you have to press the New Scene button from the form. Once you decided the name and type you can begin to select the other features. Before adding it to the list, it can be previewed using the Preview button. After pressing the Add button, the new scene is added at the end of the list. If the text is set as 'immediately' and is too long to display, then the system will notify us by marking the oversized part as blue text. To edit a scene simply select it in the list. 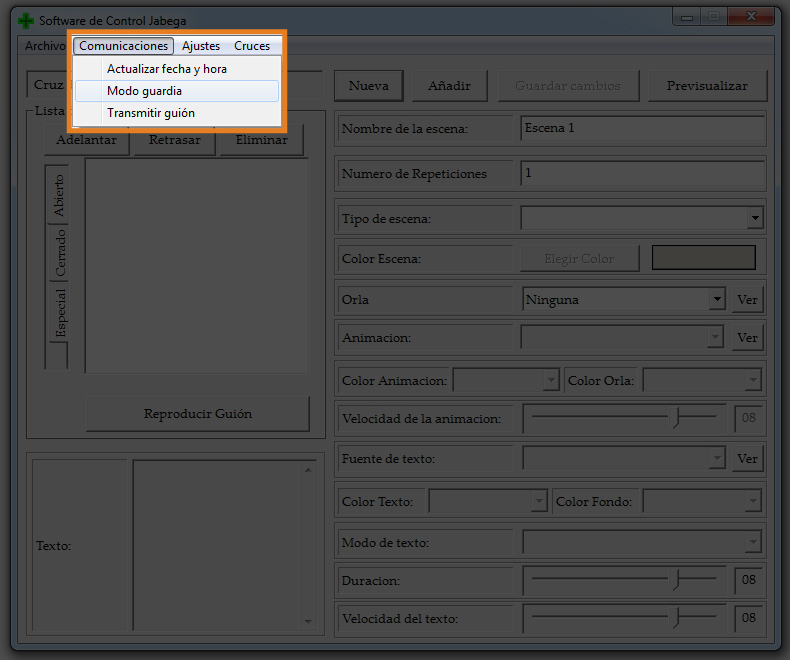 With this, its parameters are displayed on the form. 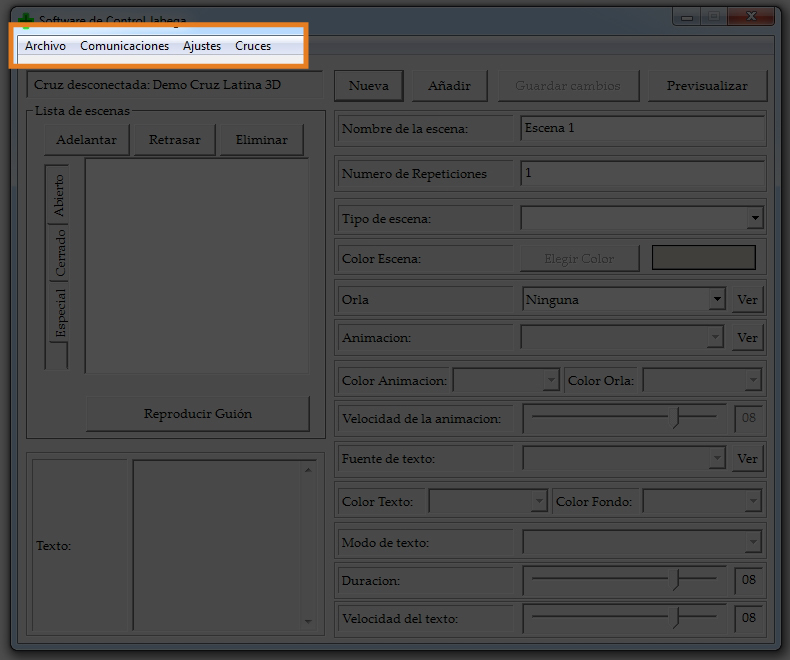 From that moment the contents of the form can be modified. Upon completion of the modifications just press the Save Changes button. When you are about to generate a scene, you must specify the type in the form (3), these are the types: animation, text, time, date, temperature and ultraviolet. Select an animation from the list as well as its speed and number of repetitions. You can optionally specify a border. It is also valid to specify a border without any animation. It allows you to type the text to be displayed on the cross. How to represent this text can be selected from three options: immediate, horizontal displacement and vertical displacement. For the text you can also specify the font type, duration if the speed is immediate and if horizontal or vertical scrolling. Optionally you can select a background animation. The text will always appear above the animation, so that the animation will never interfere with the text visualization. Optionally, you can also select a border. The border always appears above the text and animation so that the border is always visible. This must be taken into account when writing an immediate text as the border could cover a part if it is too large. This type of scene displays the time in HH: MM format. It has the same characteristics as the Text type. This type of scene displays the date with the format DD.MM.YY. It has the same characteristics as Text type. This type of scene displays the temperature with the format 00°C. It has the same characteristics as Text type. This type of scene writes the level of ultraviolet radiation with "Ultraviolet Index Low: <2" format. It has the same characteristics as Text type. This menu is used to start and finish working with script files. 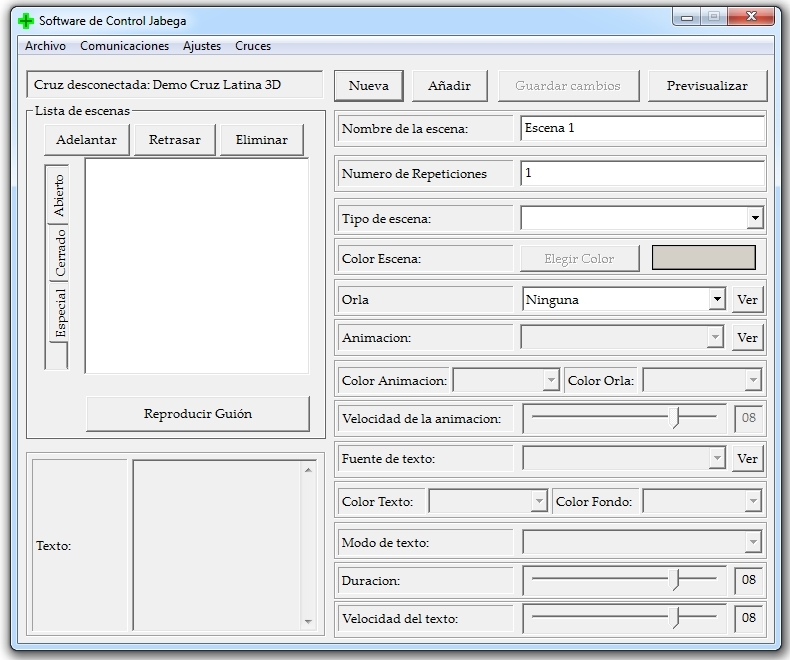 This option prepares the program to create a new script from scratch. This does not erase any previously saved scripts. If you were working on a script the program will ask you to save it before proceeding with a new one. With this option you can load a script previously created and saved. This option saves the script in which you are working. In case you have not specified a path to save it at, then a window opens that allows you to do so. It is highly recommended to be save the script before transmitting it to the LED screen or pharmacy cross, or if you want to change it later. This option opens a window in which you can select a file to save the script. This option closes the program. Before leaving, it checks if there are any changes in the script and asks if you want to save. The actions explained in this section will only be possible if the pharmacy cross or LED panel are connected and turned ON, because they require communicating. With this option you can set the time on the pharmacy cross. It is rarely used, since the cross changes automatically from summer to winter time and vice versa. To update the date and time there are two methods, the most comfortable is automatic, where the pharmacy cross acquires the date and time from the PC, the other is the manual, which the user enters the time using a form. With the "Yes" button it updates the time and date of the cross taking the information from the connected computer. 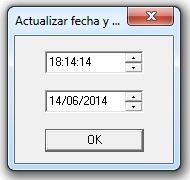 With the "No" button, it will open a new window in which you can specify the time and date you want. 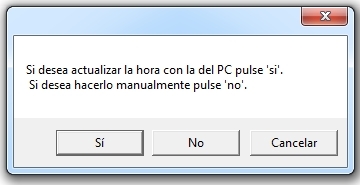 "Cancel" will close the window without making any changes. The box can be modified when using the buttons on the right or by entering the numbers directly. Box date can be modified using the buttons on the right or by entering the numbers directly. The Ok button starts updating the time. The X closes the window without updating the time. This opens the window figure shown below. Here we can control the 'on duty' mode of the cross, either to start, stop or check their status. It is not necessary to transmit the script to update the 'on duty' mode. 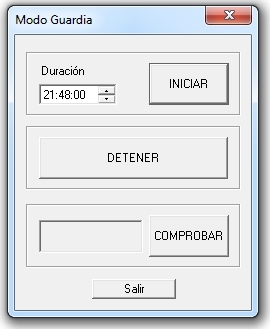 Dialog window to: Set 'on duty' mode with the control software for LED panels. The "Duration" field specifies the duration of the 'on duty' mode you want to start. When you press "Start" the cross begins to show the special script (On Duty) and will continue showing it until the time specified under "Duration" time option. Once its finished, it will look up the schedules to determine what should be displayed next. At any moment we can finish the 'On Duty' Mode by pressing "Stop". By pressing "Check" you can read a text message that informs us of the current state of the 'On Duty' mode. The "Exit" button closes the window. The X closes the window without saving the entered data. This option allows you to transmit the script to the cross. Before transmission is checked if there are any changes, in that case you will be given the opportunity to save the changes. The parameters collected here will be transmitted along with the script generated. That is, whenever you want to change any of these parameters from the cross, it is necessary to transmit the script using the 'Transmit Script' option. This opens the window shown below. Here we can change the temperature value by varying the value provided by the sensor. 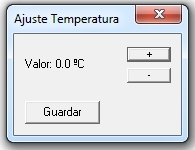 The "+" button increases the temperature setting in a tenth of a degree Celsius. The "-" button decrements the temperature setting in a tenth of a degree Celsius. The "Save" button closes the window and saves the entered value. The X closes the window without saving the entered value. This opens the window shown below. Here we can modify the slots that define the behavior of the device (LED Panel or pharmacy cross). Pressing "Save" closes the window and saves the data entered. With the "Always Open" button, the schedule is modified so that the whole set of scenes from the 'Open' tab are always being shown. With the "Always maximum brightness" button, the schedule is modified to always give the maximum brightness possible. Pressing "Reset" resets the values to default schedule. Times are independent for weekdays, Saturdays and Sundays. You can specify two slots for each block. 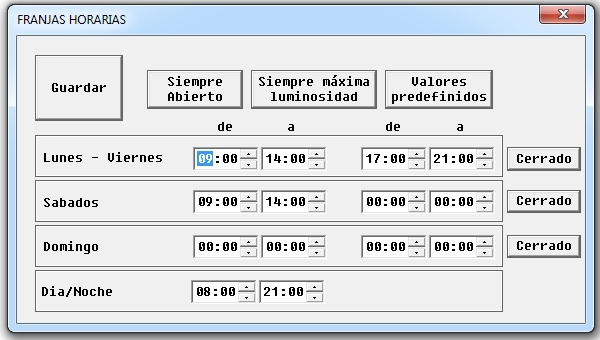 Each pair of boxes specifies a time slot within the corresponding days. Whenever the cross is within these strips one of the set of scenes belonging to Open will be displayed. To cancel a strip just put the same time in both boxes. The daytime and nightime schedules are used to control the brightness of the pharmacy cross or LED panel, this is explained later. This couple of boxes set the time slots in which it is daytime. When the cross is within this range, then the daytime brightness level specified in the brightness window is used. Otherwise the nightime level is used. The X closes the window without saving the entered data. This option opens the window shown below. Here we can set the brightness level of the cross or LED screen according to the above explained stripes. With the 'Daytime' scrollbar, we set the brightness level during the day. With the 'Nightime' scrollbar, we set the brightness level during the night. The "Save" button closes the window saving the information. These menu options are only necessary when you want to use the same software to control two or more crosses. Each device will have its own configuration and its own script. If more than one device is connected the program will start showing the window at section 1.6 so you can select which cross you want to work with. 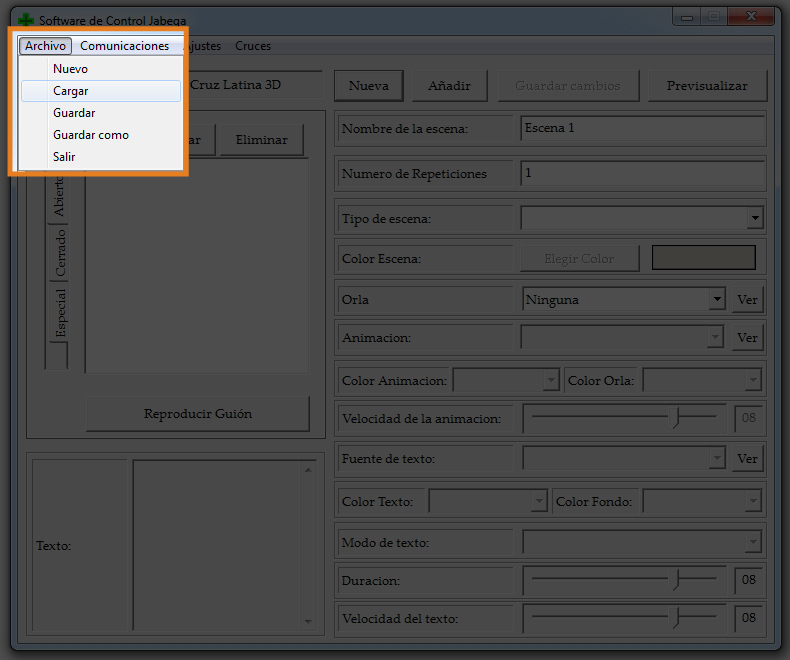 If there is only one cross, it is automatically selected and the selection window is NOT displayed. This option will search for new connected devices. If only one is connected, it has no effect. If more than one are connected, then the window shown in the picture below opens up. Here we can see the list of connected devices and we can change their names. Pressing "Search Devices" starts the port scanning looking for connected crosses. 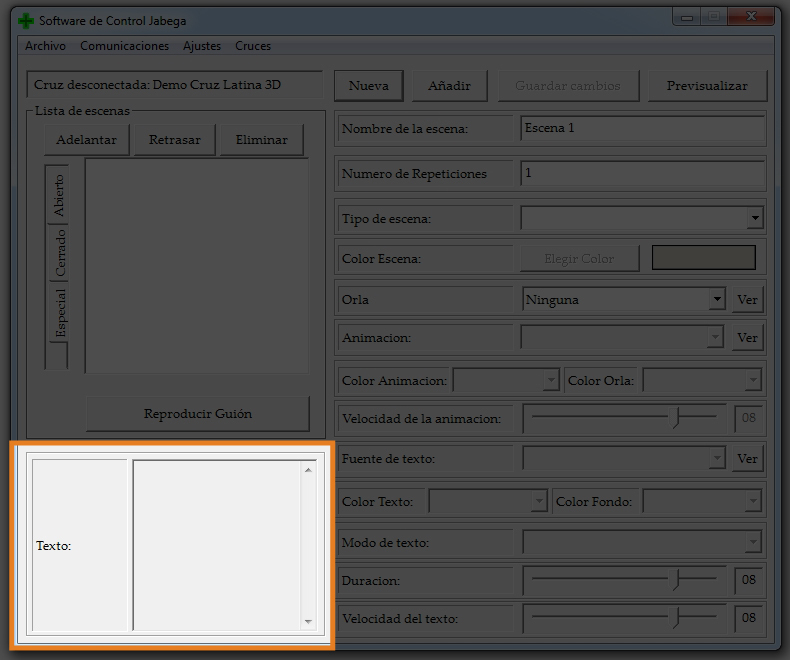 In the text box we can see the name of the selected cross in the list and modify it. Using the list of connected devices you can work on any connected pharmacy cross or LED panel. Just double-click on its name in the list. This option allows you to select between the connected devices without leaving the program. If only one device is connected, it will have no effect. Do not hesitate to contact us. Ask us anything, we are always ready to assist you.